Because, just as important as being able to wake up at the right time, is that you have the deepest and most refreshing sleep. 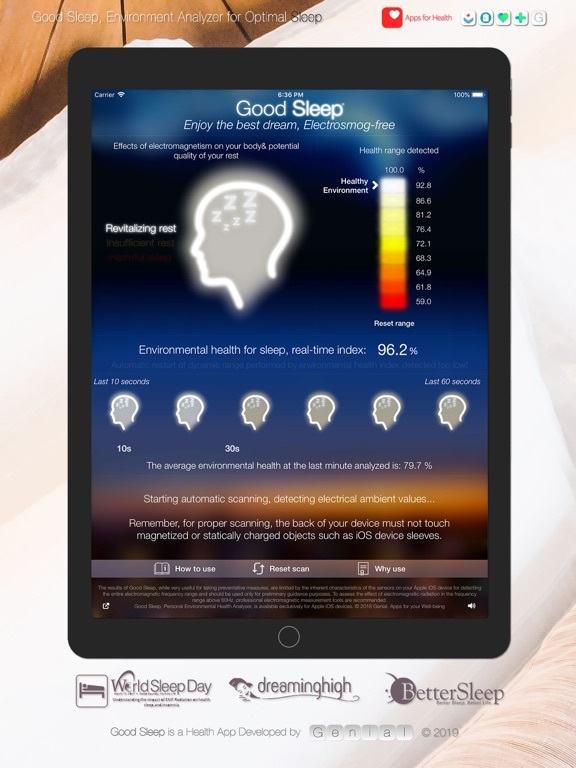 For this reason, we have created Good Sleep, the health app for iPhone dedicated to getting you a perfect sleep, using the latest scientific advances, which have revealed that environmental pollution caused by electrical devices produces a decrease in the melatonin levels of your body. This in turn can cause a decrease in the quality of your sleep every night, and a reduction in the ability of your body cells to regenerate, a process that is undoubtedly vital for your daily well-being and for you to enjoy perfect health throughout your life. 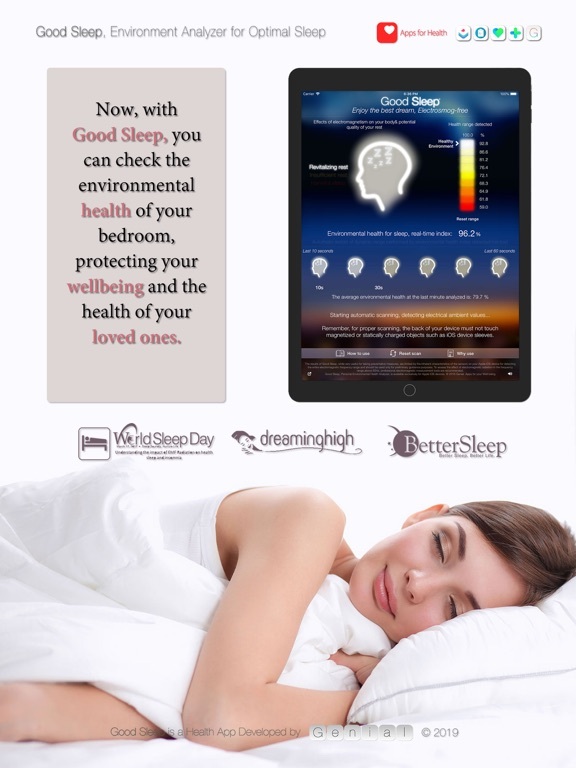 The intelligent algorithm of Good Sleep detects the areas of your bedroom that are healthiest for sleep, conveniently advising you on whether there is any risk to your health or wellbeing. In this way, Good Sleep improves the quality of your sleep so that you can undertake your daily tasks with maximum relaxation, strength, and concentration. 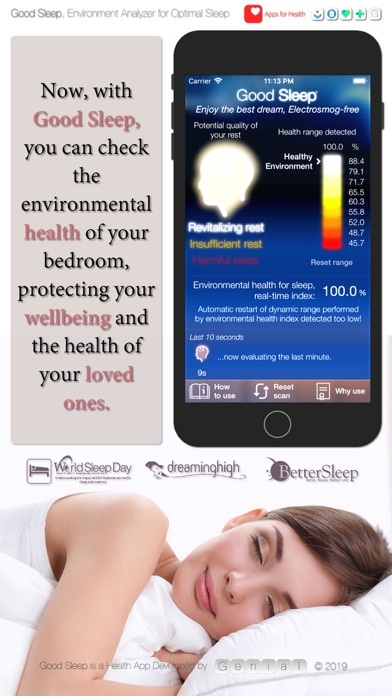 √ Intelligent environmental scanner that uses the sensors of your Apple iOS device to automatically adapt to the environment, detecting electrical pollution in your sleep area and alerting you if necessary. √ Dynamic graph showing the values of electromagnetic pollution detected every instant in the environment of your home. √ Dynamic graph showing the potential effect of electromagnetic pollution on your body in real time. √ Six dynamic graphics that show the potential effect of Electrosmog on your body at the last minute scanned. 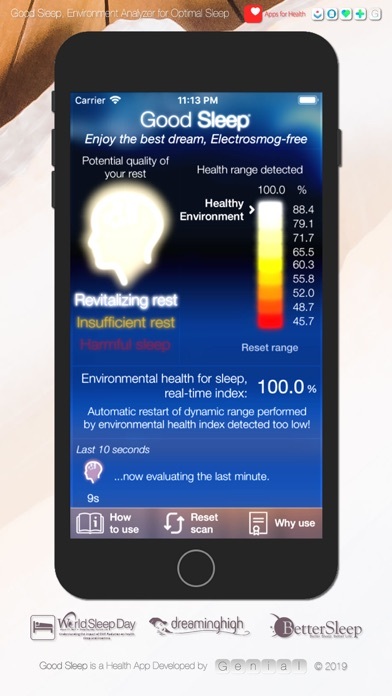 √ Alerts and recommendations to help you improve the quality of your sleep, that is, your health. 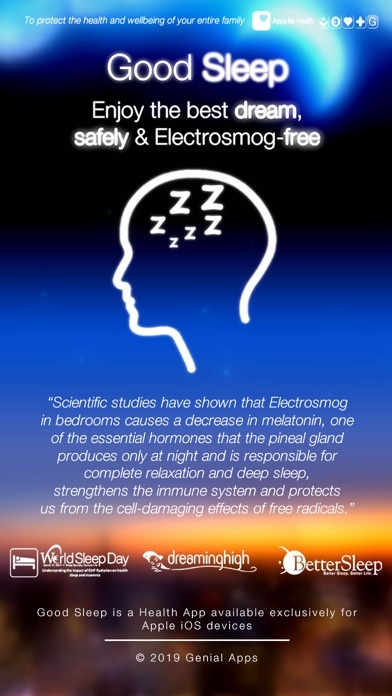 √ Vital documentation of the latest scientific advances and research that have revealed the risks of electromagnetic pollution and its effects on health. 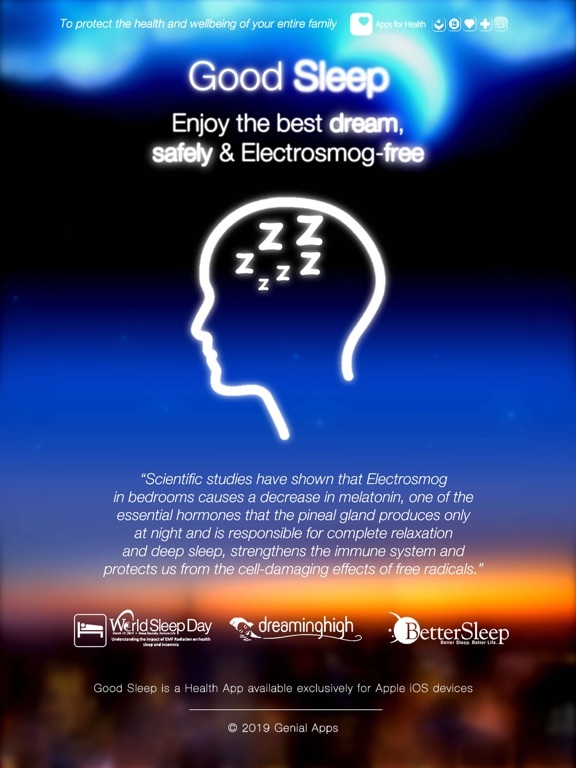 √ Through a personalized test, you can discover whether electromagnetic radiation or Electrosmog is seriously affecting the quality of your sleep and endangering your health. Good Sleep is recommended for use if you use your iPhone in bed, or if you charge it at night near your sleeping area, especially if you use a wireless charger. 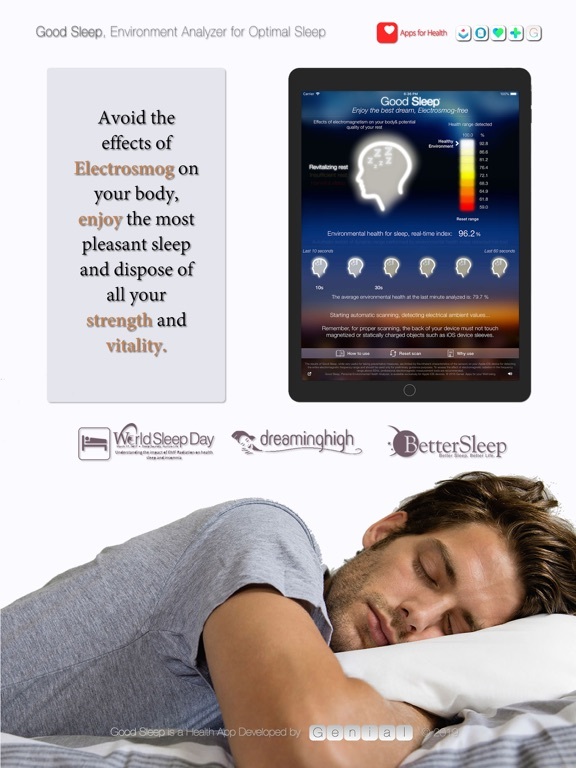 In these cases, Good Sleep alerts you and advises you to use your Apple iOS device in the safest way. 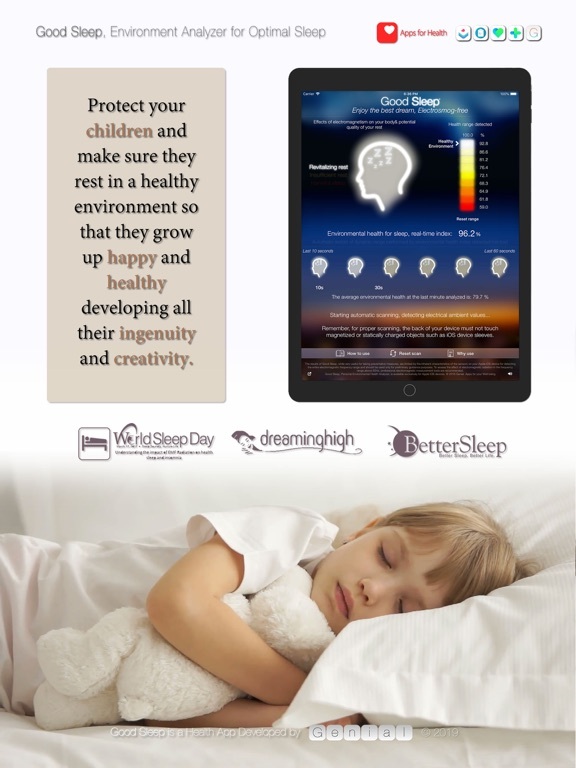 Now, with Good Sleep, you can get a complete sleep and ensure using your valuable Apple iOS device and any appliances in your home, while also preserving the health of your entire family. Considering all of these advantages, Good Sleep is undoubtedly one of the best investments you can make to protect your health. 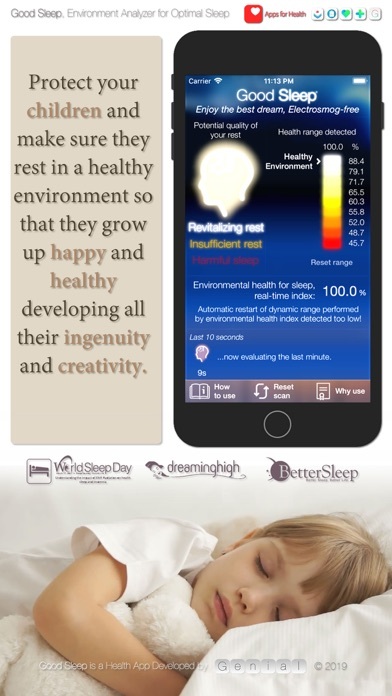 Do not hesitate; with Good Sleep, you will not only get a truly restful sleep and a full rest, you are also buying a higher quality of life and acquiring better health. 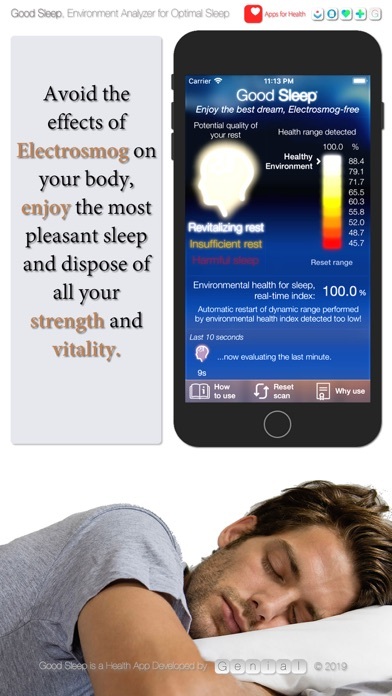 - Added personalized test to discover whether electromagnetic radiation or Electrosmog is seriously affecting the quality of your sleep and endangering your health.